Whatever you do, don’t let any of your authentic sushi-loving friends know you made this salad. It’s just too embarrassing. Only Americans could dream up a cheater’s version to homemade sushi. But it’s really good. And it’s really easy. The best part about it? I don’t have to watch my kids tear apart the expensive sushi I purchased or the homemade sushi I slaved over just so they can eat the rice. 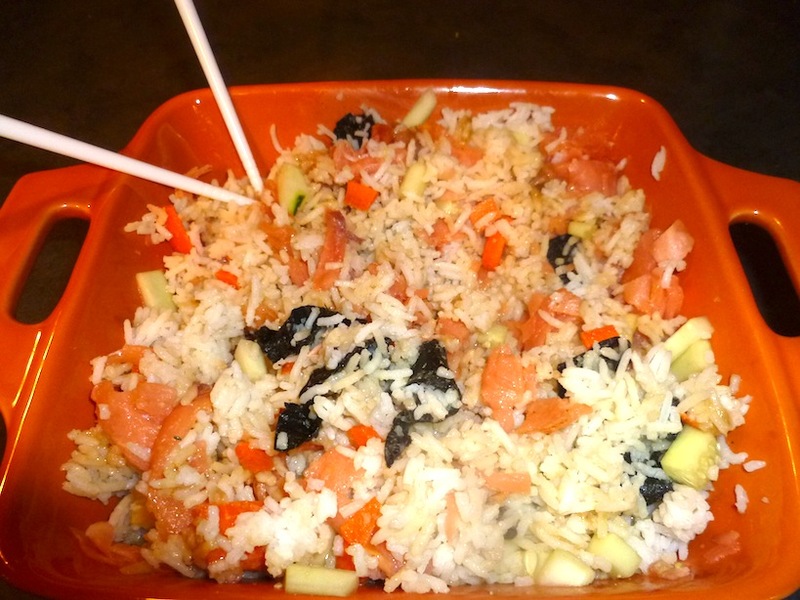 Prepare the rice and add a 1t rice vinegar to keep it from sticking together to much. Mix together the dressing in a small bowl. Let the rice cool and mix the nori and sauce into it. Chop the fish into bite-size pieces. Add the fresh vegetables and fish and serve at room temperature. Pretend you’re sophisticated by using chopsticks. Or just shovel it in with a spoon.